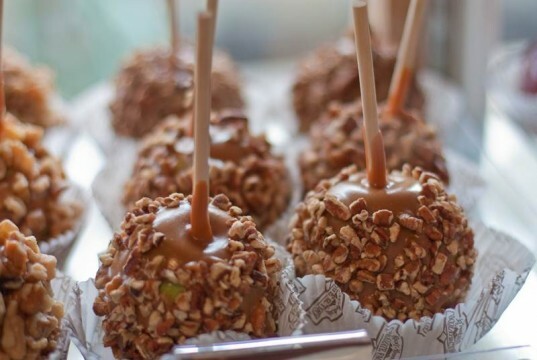 If you're looking for a fast fall treat, caramel apples can't be beat. Organic apples are super fresh during the fall season, and healthy to boot. If you eat the peel, apples are packed with fiber and vitamin C, plus they'll fill you up and taste great. Adding soft, gooey organic caramel is like the icing on the cake, or the apple as the case may be. 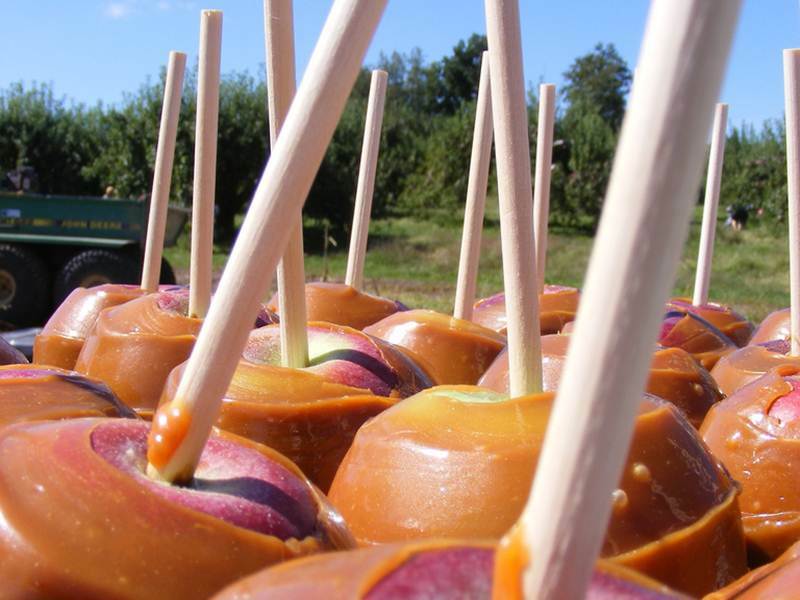 Keep reading to learn how to make festive fall caramel apples. First of all, organic is a must, no matter what apple treat you’re making. Apples topped the Dirty Dozen list this year, meaning conventional apples have more pesticide residue than other produce. After choosing organic though, you have many choices. Granny Smith are traditionally used in caramel apples, but personally, I like Honey Crisp apples best for caramel apples and Red Delicious are good too. Just make sure you choose a crisp, hardy apple. For instance, I wouldn’t use Gala apples because they’re softer texture doesn’t mesh as well with the caramel. A fun way for to gather organic apples, is to head to an organic you-pick farm or your local farmers’ market. Homemade organic caramel sauce can be tricky. There’s a lot of stirring involved, but if you have the time, it’s not too bad. Whisk together 1 cup heavy organic cream, 3/4 cup light corn syrup (or corn syrup alternative), 1/2 cup organic butter and 1 cup organic brown sugar. Bring the mixture to a boil slowly over medium heat. You must continue stirring the WHOLE time. After about 8 minutes the caramel should start to look ballish (called the soft-ball stage). Drop one tablespoon of the mixture into a cup of icy cold water. If the caramel forms a solid, but flexible ball, it’s done. At this point stir in 1 teaspoon real organic vanilla extract. Take the pan off the heat and let it cool a little before dipping your apples. Note: If you’re 100% not down with corn syrup, I found a recipe made with maple syrup, but haven’t tried it, mainly because organic maple syrup is so runny, it seems like it wouldn’t thicken well. I also found a homemade caramel option made without corn syrup, but it looks a bit thin to me, and I haven’t tried it on apples. 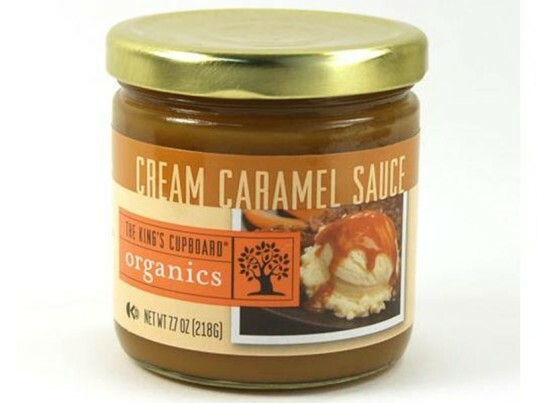 King’s Cupboard makes a certified organic caramel sauce that may be poured nicely over already sliced apples if you like caramel apples in a bowl, instead of on a stick. The King’s Cupboard brand may be too soft for apples on a stick, but feel free to give it a whirl. Nature’s Flavors offers a caramel dip for apples that’s 100% organic, lactose-free, gluten-free, vegan and kosher. If your family is vegan, but you like homemade, try this recipe for vegan caramel apples. If you’re using organic caramel candies to make your sauce, you need to place about 12-14 oz caramel candies, along with two tablespoons water and 1/2 teaspoon organic vanilla extract into a saucepan. Melt the candies slowly, on low heat, stirring the whole time until a saucy consistency is reached. 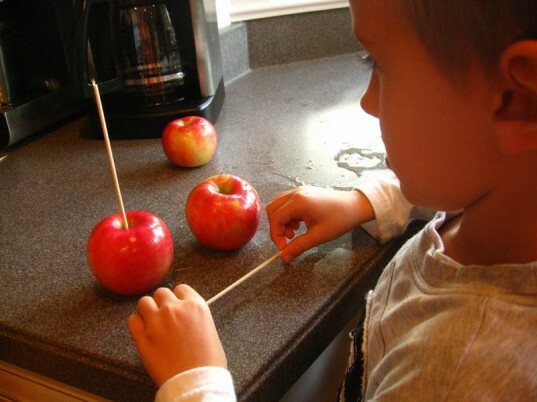 Sustainable sticks for your apples – try bamboo skewers, reusable chopsticks or real twigs (clean of course). Wash your organic apples. Sometimes, with caramel apples the caramel can slide right off the apple, not sticking to it as it should. This is because your caramel is too hot or too watery or it’s due to the wax coating on the apples. With organic apples, wax shouldn’t be a problem, but nevertheless, make sure your apples are 100% clean and dry so the caramel will stick. Stick your sticks into the apples. If you’re making homemade caramel sauce, go ahead and do that step now. If you’re using a pre-made sauce, or caramel candies heat it up now. Once your sauce is ready, it’s time to dip your apples, which can be tricky. You can place the sauce in a bowl, and place the apple on top and spoon the sauce over it with a spoon. You can also dip. If you dip, work carefully, but quickly. Dip the apple into the warmish hot (not too hot) caramel sauce, spinning the apple a little as you dip. Because you need to work quickly, this is a harder job for younger kid helpers. After dipping, try to scrap any excess off the bottom of the apple using a knife or the side of the pan. Place your apples on a sheet of foil or on a silicone mat. Your last option is to hold and twirl the apple over the pan of caramel sauce while ladling sauce onto the apple. Looks don’t matter as much if you’re going to cut your apple into slices or coat it with toppings. Chill your apples and then eat or cut and eat. Chilling does help the caramel to set, but you can technically keep finished caramel apples at room temperature. I like them better at room temp than chilled. If wrapping caramel apples for a party, wait for the caramel to set entirely before wrapping them, or the caramel may become a drippy mess, sticking to the bag. There are not great eco-friendly methods available for transporting caramel apples around town, but if 100% necessary, Sugarcraft has many apple wrapping options. First of all, organic is a must, no matter what apple treat you're making. Apples topped the Dirty Dozen list this year, meaning conventional apples have more pesticide residue than other produce. After choosing organic though, you have many choices. 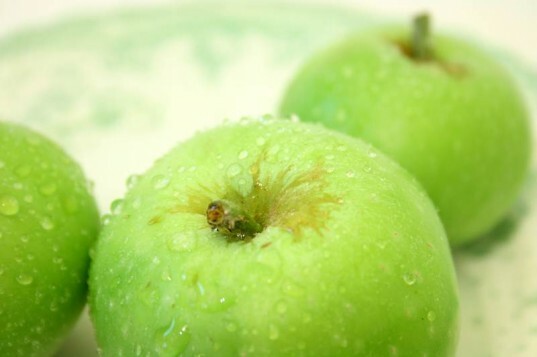 Granny Smith are traditionally used in caramel apples, but personally, I like Honey Crisp apples best for caramel apples and Red Delicious are good too. Just make sure you choose a crisp, hardy apple. 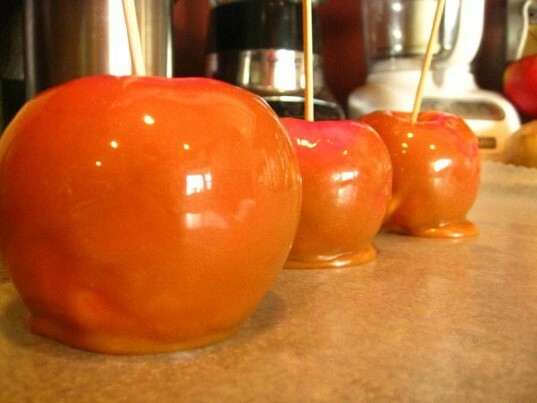 For instance, I wouldn't use Gala apples because they're softer texture doesn't mesh as well with the caramel. A fun way for to gather organic apples, is to head to an organic you-pick farm or your local farmers’ market. Homemade organic caramel sauce can be tricky. There's a lot of stirring involved, but if you have the time, it's not too bad. Whisk together 1 cup heavy organic cream, 3/4 cup light corn syrup (or corn syrup alternative), 1/2 cup organic butter and 1 cup organic brown sugar. Bring the mixture to a boil slowly over medium heat. You must continue stirring the WHOLE time. After about 8 minutes the caramel should start to look ballish (called the soft-ball stage). Drop one tablespoon of the mixture into a cup of icy cold water. If the caramel forms a solid, but flexible ball, it’s done. At this point stir in 1 teaspoon real organic vanilla extract. Take the pan off the heat and let it cool a little before dipping your apples. Note: If you're 100% not down with corn syrup, I found a recipe made with maple syrup, but haven't tried it, mainly because organic maple syrup is so runny, it seems like it wouldn't thicken well. I also found a homemade caramel option made without corn syrup, but it looks a bit thin to me, and I haven't tried it on apples. King’s Cupboard makes a certified organic caramel sauce that may be poured nicely over already sliced apples if you like caramel apples in a bowl, instead of on a stick. The King's Cupboard brand may be too soft for apples on a stick, but feel free to give it a whirl. Nature’s Flavors offers a caramel dip for apples that’s 100% organic, lactose-free, gluten-free, vegan and kosher. If your family is vegan, but you like homemade, try this recipe for vegan caramel apples. If you're using organic caramel candies to make your sauce, you need to place about 12-14 oz caramel candies, along with two tablespoons water and 1/2 teaspoon organic vanilla extract into a saucepan. Melt the candies slowly, on low heat, stirring the whole time until a saucy consistency is reached. Gather the following: Saucepan Ladle Recycled foil or a silicone mat Sustainable sticks for your apples – try bamboo skewers, reusable chopsticks or real twigs (clean of course). Wash your organic apples. Sometimes, with caramel apples the caramel can slide right off the apple, not sticking to it as it should. This is because your caramel is too hot or too watery or it's due to the wax coating on the apples. With organic apples, wax shouldn't be a problem, but nevertheless, make sure your apples are 100% clean and dry so the caramel will stick. Stick your sticks into the apples. If you're making homemade caramel sauce, go ahead and do that step now. If you're using a pre-made sauce, or caramel candies heat it up now. Once your sauce is ready, it’s time to dip your apples, which is tricky. You can place sauce in a bowl, place the apple on top and spoon the sauce over with a spoon. You can also dip. If you dip, work carefully, but quickly. 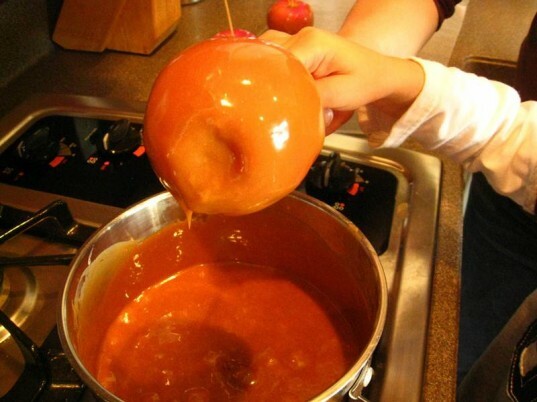 Dip the apple into the warmish hot (not too hot) caramel sauce, spinning the apple a little as you dip. Because you need to work quickly, this is a harder job for younger kid helpers. After dipping, try to scrap any excess off the bottom of the apple using a knife or the side of the pan. Place your apples on a sheet of foil or on a silicone mat. Your last option is to hold and twirl the apple over the pan of caramel sauce while ladling sauce onto the apple. Looks don't matter as much if you're going to cut your apple into slices or coat it with toppings. Toppings can be a pretty and tasty addition to caramel apples. If you'd like to use toppings, don't dip the apples into a bowl of topping though. Instead pour your topping of choice onto a small plate. Then twirl the apple through the topping. This results in a much lighter coating. Some good topping ideas are below: Chopped, Fair Trade nuts (unsalted) Candy sprinkles for the kids Mini organic chocolate chips Pipe on melted white or dark chocolate Crushed up Newman’s Own Organics O’s – basically Oreo cookies, but organic Toasted organic coconut Sun Drops Chill your apples and then eat or cut and eat. Chilling does help the caramel to set, but you can technically keep finished caramel apples at room temperature. I like them better at room temp than chilled. If wrapping caramel apples for a party, wait for the caramel to set entirely before wrapping them, or the caramel may become a drippy mess, sticking to the bag. There are not great eco-friendly methods available for transporting caramel apples around town, but if 100% necessary, Sugarcraft has many apple wrapping options.